In September, about the same time that Sister Cities was launching at three different sites, another group exclusively for women had its first rehearsal. The Bucks County Women’s Chorus provides a musical and social outlet for about 70 women of all ages. SCG Teaching Artist John Gilmour serves as the choir’s accompanist, and when director Pat Guth asked for ideas about musical organizations to which the choir could contribute, John suggested Sister Cities. 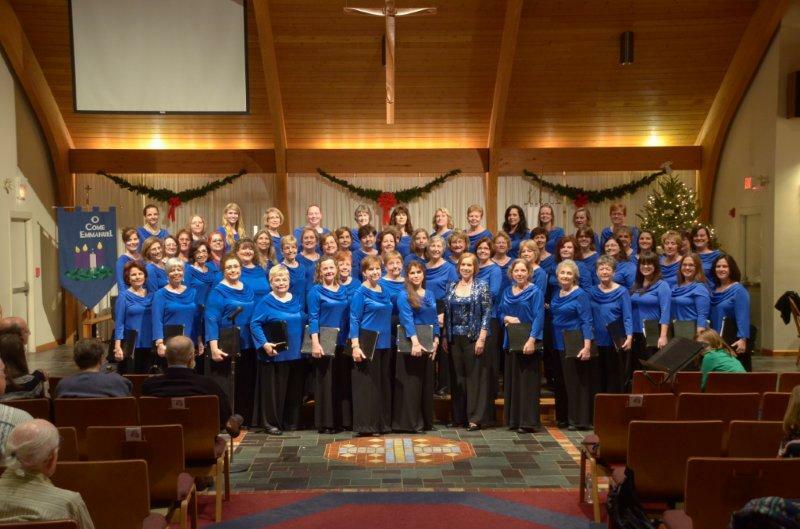 The chorus, through ticket sales for concerts, raised $500 to support the mission of SCG. We are so thankful for the generosity of these women, and to Pat, who has offered us her extensive library of music for treble voices. It’s wonderful to know that the potential of Sister Cities girls has inspired so many people and moved them to give. We look forward to possible future collaborations with the women’s chorus, and thank them for their support. Previous Super Saturdays: December 8th! Speaking as a member of Bucks County Women’s Chorus, I can’t think of a better way to be a part of a singing community than to help Sister Cities Girl Choir. Kudos to John for bringing us together! Looking forward to meeeting the girls on March 9th. We are excited to have BCWC with us for lunch on our next Super Saturday– Thank you for showing your support of the Girls!